Visible light on Earth largely comes from the sun and varies daily, even at night when sunlight is reflected from the moon creating moonlight. Life on Earth’s surface has evolved under natural regimes of light-dark cycles. Nocturnal animals also experience variations in the level of moonlight caused by the moon’s orbit around the planet. Recent proliferation of artificial lighting and its subsequent light pollution can disrupt these natural cycles. Our article, “Waddling on the Dark Side: Ambient Light Affects Attendance Behavior of Little Penguins,” published in the Journal of Biological Rhythms, is the result of our research assessing how sunlight, moonlight and artificial lights affect the “patterns of attendance” to the colony of little penguins (Eudyptula minor) at Phillip Island, Australia. 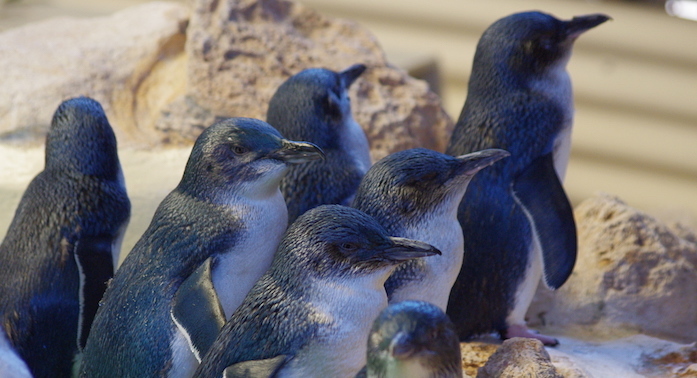 The little penguin is the smallest and the only penguin species whose activity on land is strictly nocturnal. In contrast to many seabirds, this species returns ashore on a regular basis throughout the year, even outside the breeding season. To come ashore they use the same pathways from the water edge to their nests. Thus, they provide a good model for studying the effect of light on the annual pattern of colony attendance. We used 13 years of attendance colony data from two colonies under different lighting conditions: natural night skylight and artificial lights (around 3 lux) used around sunset for eco-tourism penguin viewing. The level of artificial light used at our lit colony is higher than the maximum moonlight illuminance. Thus, artificial lights could override the full moon light and mask some of the behaviors regulated by moonlight. Automated monitoring systems recorded individually marked penguins every time they arrived at or departed from the two colonies. Sunlight had a strong effect on attendance as penguins arrived on average around 81 mins after sunset and departed around 92 mins before sunrise. Penguin arrivals and departures varied seasonally according to sunset and sunrise times, respectively. Thus, penguin real time attendance was more than two hours earlier around winter solstice, i.e. when the night is longer, than around summer solstice, i.e. when the night is shorter. The effect of moonlight was also strong, varying according to moon phase. Fewer penguins came ashore during full moon nights, probably because they perceived a higher predation risk from the higher visibility created by moonlight. The moon phase effect was stronger on departure than arrival times. Thus, arriving penguins come back to the land after spending daylight hours foraging at sea and they could be in hurry to arrive on the land to do their duties (nest-burrow defense or maintenance, courtship or chick rearing). On the other hand, departing penguins could be more interested in starting a new foraging trip as soon as practicable, especially during breeding when they must forage for nestlings and themselves. In fact, departure times (before sunrise) were earlier, coinciding with high moonlight levels. Although maximum moon light levels are probably too low for fishing (no little penguins have been recorded foraging at night), they could be enough for arriving earlier at their foraging areas or avoiding predation at sea. Because artificial lights could override the moonlight, we predicted that moon light effect would be weaker in the artificially lit colony. Contrary to our predictions, we found similar arrival patterns at both colonies, which may indicate that artificial illumination, at least at the levels employed in our study, does not mask the moon effect on the arrival attendance behavior. However, our conclusions on artificial light effects must be taken with caution, as further research is indeed necessary to understand how seabirds respond to the increasing artificial night light levels. Airam Rodríguez is a postdoctoral researcher at Phillip Island Nature Parks, Australia, and Estación Biológica de Doñana CSIC, Spain, thanks to a Marie Curie International Outgoing Fellowship within the 7th European Community Framework Programme (No. 330655). His project looks for solutions to the fatal attraction of seabirds to artificial lights (more info at http://ecolightsforseabirds.weebly.com). Citation: Rodríguez A, Chiaradia A, Wasiak P, Renwick L, Dann P (2016) Waddling on the dark side: ambient light affects attendance behaviour of little penguins. Journal of Biological Rhythms doi:10.1177/0748730415626010.